40 in January, 400 in February? In January, Tesla registered so far the biggest batch of European Model 3 in the Netherlands – 40 units (compared to 17 in Norway). Those are not sales yet, which are scheduled for February. The reason for that is, of course, that from January 1, 2019 all the BEV models (with prices above €50,000) are higher taxed, so interested customers purchased them earlier, by the end of 2018. It will be quite some time before sales will rebound. From January 1, 2019, the BiK tax increased from 4% to 22% for BEVs that costs more than €50,000 (the 22% applies only to amount above amount of €50,000). In such circumstances, the best results are noted by cheaper BEVs like the Nissan LEAF, which surge to 396! Even the BMW i3 noted decent 112 registrations. 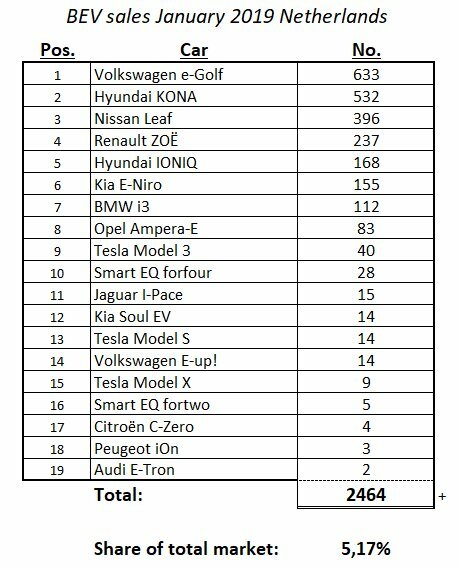 17 Comments on "In January Tesla Registered 40 Model 3 In The Netherlands"
How did you manage to write an article about EV sales in January in the Netherlands without ever mentioning the two best selling cars, the e-Golf and the Kona? Better get used to this. “The Model 3 invasion” of Europe will dominate this and other sites for the rest of the year. Yes, really weird situation, top 2 never even mentioned. Well, unlikely some other similar sites which are pretty much all about Tesla (Clean Techinca), here is still enough attention paid to non Tesla/Tesla direct competitors content. VW e-golf sales are impressive, a very expensive car with low range (while very well build) that wasn’t even supposed to be electric is beating leaf. Bjørn Nyland made a video about race between Leaf (40 Kwh) and e-Golf (38.5 Kwh) in temperatures ranging between -7 and -13. The outcome is very interesting. This explains why e-golf sales are higher than leaf. Ironically, e-golf is a compliance car while leaf is not. I can’t image what ID Neo can do. I’ve watched that video. Indeed Leaf range is “sensitive” to anything that are not ideal conditions. But I think in average it will beat the golf rage by a little bit. Leaf is still cheaper and has a better use of space in my opinion. Yep quite some test on youtube, even from France with Dutch numberplates. How are 40 (!!!!!) M3s news. How. Please try to be less ridiculous in the future. The Evannex articles (yes all of them) don’t do you any good either btw. 40 M3s ARE news because they were registered BEFORE the first shipload of 3s arrived in Europe. Will not be newsworthy at all next month. This is the effect of taxes change. The buyers for €100k EVs just rushed before the start of 2019. It happened in Denmark and other places before, this was expected. The same (at a much smaller scale) effect will be seen for EVs in the US losing the tax credit. For Tesla the price drop(s) will help a lot but many that could eventually buy the car during 2019 already did it. Abrupt tax changes have weird effects, I would rather do it in a more progressive way but I understand giving tax discounts to EVs costing over €100k is just immoral. I agree with tax incentives for EVs with reasonable price. The incentives (regardless of the price-tag and car) went to innovation and have helped speed up the transition to cheaper EV’s. Imho, the entire world population benefits from this. So let’s agree to disagree there. The new tax rules (in the Netherlands) states that the incentive only applies to the first 50k of the price of the vehicle, which I feel makes more sense now that more affordable vehicles are available. I understand your reasoning, but I still disagree :P… Nissan leaf costs a lot less and it’s very practical, some Teslas could use the range argument, but cars like the i-pace can’t even use that to their defense. EVs are inevitable, it’s weird if someone can’t see that by now, while environment shouldn’t wait to be taken care, there are so many things to be done in other areas like electricity production. EVs are a matter of time, the game is on they will win because they are better, not because they’ll have bigger incentives. There are lot of strange things about “cleaning” rules. Per example a model 3 using 30 to 40W in standby would be illegal in Europe if it was a TV (by a huge margin) . Nice to see that Opel Ampera-E (Chevy Bolt EV) is available in Netherlands. Yes that is a pleasant observation. Lets hope all the EV brands sale well in 2019. They will love those EVs for generations, as long as yellow vest do not burn them. Excellent news 5.17% EV sales, the numbers are creeping upward, slowly but on a climb. Congratulations to VW for producing a bunch of Golfs. I hope that means they are EV Golfs because I think they make two variants. They will love those VWs and Hyundia’s for generations to come. ENjoy.